Aditya Birla Group – Taking India to the World! You need to have some sympathy for someone trying to erect an identity for a boring corporation when it’s as diversified a conglomerate as it can be. And when they do remarkably deliver even on such mammoth uphill task credit is indeed due. We’re talking about the corporate ad of India’s age old Aditya Birla Group that has interests ranging from telecom to traditional industries like textiles & mining. A young flag bearer is seen sprinting with the group’s logo enduring harshest circumstances across the different countries where the group counts a presence when he witnesses warm embrace from the locals everywhere he goes! What begins with a Vande Mataram chant ends with the group’s tagline Taking India to the World! From walking on the water splash to moving into a manless desert all the while when your allies at different places pick even the faintest cues to make fire out of water droplets and spit them to stimulate a tree in another part of the world the second coming of the ad is indeed refreshingly new! Evoking the inner spirit either by ringing a bell or through a thumping beat of the giant drums is one thing but creativity reaches stratospheric proportions when a violin is made out of a sheath of grass or when droplets of falling water are turned into a guitar string and your corporate tune is made out of them. It doesn’t stop there until a flying martial artist moves along a bamboo forest trying to amplify the tune and it only gets intense until a swarm of birds move in tandem to the tune. How else would you interpret than to see the fire emitting from the drums at the end as them telling us that there’s still firepower left in their corporate armory? Taj Hotels’ ad is absolutely a class. In essence the perfect evolution of culture & civilization is captured in under 6 minutes. From time-travel to the modern workplace that it is today as portrayed should resonate well with the globe trotters used to staying in such class hotels. What starts as a message for business travelers gently changes tone to talk to pleasure seekers. Naturescapes in soothing blue water, momentary pink witnessed occasionally during dusk, and lush green underwater houses are sure a feast for the eyes. Back to business now with how office hours these days are conducted on balconies while enjoying a pot of hot tea. And in between these shifts you are also reminded that their presence from New York to London and elsewhere are perfect for both these needs. How nice would it be if you were just let to indulge in endless glasses of your favorite drink on a beach table. And what if that’s merely dubbed as a pastime while the true escapade of your dreams is about the glorious plunge from pier to nowhere. That’s how the ad turns tone to talk about the brighter life. And imagine if your dream holiday becomes the source of ultimate awakening after you’ve just fallen for the perfect sin. As they mean business again a bunch of pros in table etiquette are shown dining together. They choose to call it civilization instead! As it draws to a close, one is also told how all this has been a part of their journey for centuries now. And then the quintessential Taj Hotel the one address that has stood the test of times is revealed. A quintessential class act indeed! Indigo – On Time Every Time! The trump card of this low cost carrier from India is punctuality. Perhaps this has worked in their favor at a time when every other airline is struggling to turn a buck and are bleeding profusely. Indigo has been comfortably making profits from their first flight and every flight since – proof that you can succeed by simply being sincere to your word! Posted below are a couple of cute commercials from their fold. The first one describes in minute detail going to the extent of claiming that the economy itself benefits as Indigo’s crew enables it’s passengers to finish their work on time. Taste of success in the domestic terrain has given them the conviction to extend their wings across the borders. The TVC below is about that. The ad finishes with the tag ‘On Time is a Wonderful Thing.’ How apt! Vivaha – A Saree Fit for a Queen! Right from the launch commercial the brand has only gone from strength to strength. The TVC shows a fresh young would be bride opening her wedding invite that just arrived. Even as she begins to feel the chariot embedded in the card her imaginations run high about how her man might be marching to get her hand if this was indeed an ancient age. For the viewers though that helps picture how ancient royal weddings must’ve taken place in all it’s splendor. The soft background score for this ad was a stellar success that one could hear that humming gently in their shops even today. Yet another background music found on their website is also good and could well ignite nostalgia among a lot. Coming back to the expensive saree bit, it makes one wonder if they’ve pushed all the boundaries in making this masterpiece. The saree contains in it to name a few the famous Ravi Varma paintings and is weaved together with pure silk rubbed in gold and silver. To top it all, there’s a fertile display of the navratnas and gemstones like the Diamond, Emerald, Ruby and more! I saw a beautiful image splashed on the newspaper this morning. The ad was about a new scheme from Jet Airways where it will offer low cost tickets in association with Kerala Tourism to promote tourism in Kerala. The image was such a marvel that I thought it couldn’t get better than this to kick start a new section (that I was thinking about for sometime now) called ‘Picture Perfect.’ I will use this section to cover all image based marketing that can stand on their own and stand out! Neither Jet Airways nor Kerala Tourism need any introduction. But their coming together for this initiative definitely needed some advertising. Am assuming they chose to stick to the time tested gameplans for announcing such tie ups where you try to fuse some representations for the two participants and invent a unified version. That’s exactly what happened here. Kerala synonymous for its scenic beauty now has to merge with Jet that was voted for its long-haul airline service. 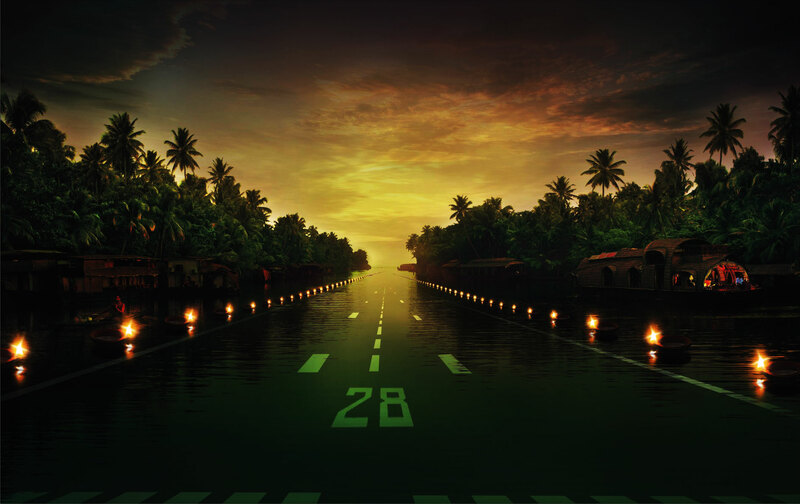 The result – A typical Backwater Strip was converted into a Runway. A mere insertion of white dotted road dividers on the long narrow water stretch did the trick. With lush green trees and houseboats on the edges and large earthen lamps floating around, it just gets more glamorous. Truly a piece of picture perfection! I was still in school when TVCs introducing a new brand called Chevrolet screened across channels of all genres from sports to vernacular entertainment. The well orchestrated brand entry aided by spectacular launch campaign commercials helped the brand win the hearts of millions right from its launch. I have chosen to blog on this topic for two reasons: i) I like brand entries and launch campaigns for a fact. ii) Like I mentioned in the first post of this blog, I can never resist the temptation to blog on brands that are so close to my heart. Dwelling deep into the launch commercials one would find that the TVCs were simply stunning. 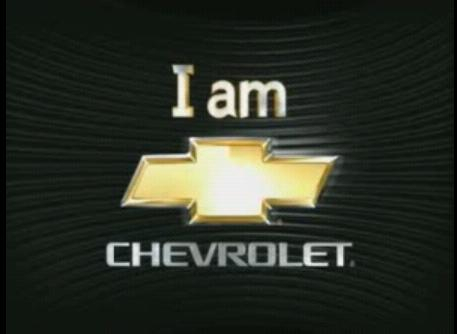 The message was about a bold brand yet it was conveyed in such gentle fashion that it sparked of a mild curiosity among viewers on what this new campaign called ‘I am Chevrolet’ was all about. Igniting that gentle curiosity was an intentional drive and was in fact executed flawlessly by exercising thorough restraint from either talking anything about cars or touting the legacy that the brand has in other existing markets. All that was conveyed by the commercials was the message that something new is coming your way which will form an integral part of your life [Cars are still a luxury in the majority of India though 🙂 ] and that’s none other than me Chevrolet – one of the most renowned car brands that many in its niche target segment may already be familiar with. Careful choice of elements like the Sun, Rain, Joy, Smile and so on combined with a soothing background theme make the ads very attractive. The two verses found on the two versions of the ads are below. If there is one thing stands out in the campaign and the brand in general it’s the ability to gel well with the culture of the landscape and that too almost instantly and with ease. Memories! Marketing That’s Worth It………. ………Only a few circles in the water prove that she was there…. ………She’s forgotten……….. Without a trace……………….. The above lines that I remember reading elsewhere have some relevance to what this blog is about and what marketing itself is all about. Like how the poetic lines symbolize that it’s the trace of few circles in the water that show something existed, it’s the memories of marketing we cherish that remind us of something that we loved existed. The aim of this blog is to capture those memories and not to let them just fade away. This blog will contain videos, pictures, commentaries and so on about any marketing campaign in any form that’s worth remembering. Marketing knows no boundaries and therefore the blog will also cut across a variety of regions and languages. I promise to provide English translations wherever applicable. Being just another homo sapien, I ain’t any exception to personal biases and strong opinions towards certain marketing efforts. As also heavy coverage to certain sections of industries and a handful of brands that are so close to my heart. In true spirit of democracy, feel free to challenge or criticize anything through contrary comments or in any other way.